A high spec home use body slimming device with RF x Ultrasonic cavitation x EMS. Reduces fat and cellulite with RF and Cavitation technology and firms the muscles with EMS for more toned and shaped body line. An extremely effective and safe way of body slimming/shaping. “Circle RF Technology” utilizes YA-MAN’s unique and patent pending “special circular flat electrode” that provides hyper-thermic effect to the skin evenly and efficiently. 1MHz of Radio Frequency -A technology used at professional salons. 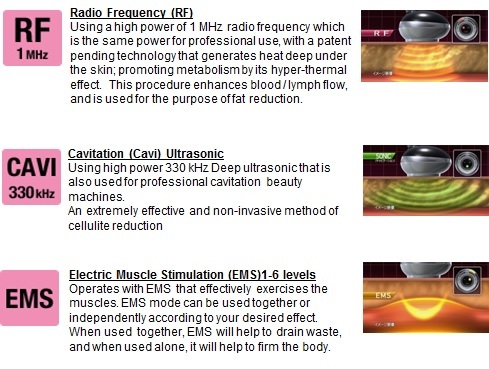 RF + Cavitation + EMS can be used all together at the same time. This machine uses the latest top techonology, combines EMS, RF, Ultrasonic 3 functions in one machine. EMS: the micro current smart techonology, via the 600 times/min, electronic pulse current which acts on the coordination ditrctly, can reach the deep fat tissue, stimulate the muscle generates contraction motion, thus consimes the extra fatness to achieve the goal of body contouring and tightening. RF: radio frequency, is one of the most popular slimming techonology. Adopts 40.68MHz can make the water molecule of the cells have a strong resonance rotation, accelerate body fat mobilization accelerate the blood circulation, recolves the fat acid, dat tissue apotpsis. Ultrasonic: with 330Khz sonic slimming means the sonic machine distributes certain frequency and certain amount of sonic wave under the skin, to make the fulid inside and outside cells produce many voids. When these voids occur explosion, will result in the cells break down. * Reduce fat in areas of body (various types of skin). * Effectively improve body shape, remove local carnosity, and reduce local lipocele. Slimming & Shaping: slimming neck, limbs, buttocks and abdomen; shaping face, breast and buttocks. Firming & Lifting: body shape restoration after delivery and liposuction. Slimming: reduce cellulite, remove carnosity, and improve skin laxity. Firming: strengthen the firmness of skin, increase the elasticity of skin, improve orange peel and postpartum stretch marks etc.